The Blue Jays announced today that they have signed veteran infielder Freddy Galvis. It’s a one-year deal that includes a club option for 2020. Galvis receives a $5MM guarantee, per MLB.com’s Mark Feinsand (via Twitter). That includes a $4MM salary for the coming season and $1MM buyout on a 2020 option that can instead be exercised at $5.5MM. Righty Danny Barnes was designated for assignment to create 40-man roster space. Galvis, 29, has logged a ton of innings at shortstop over the past several seasons for second-division clubs. In fact, he appeared in all 162 games in 2017 with the Phillies and in 2018 with the Padres. He was rumored to be a target of the Pirates after talks for a return to San Diego seemingly fizzled earlier in the offseason. As it turns out, Galvis will join a Toronto club that doesn’t seem to have much hope of contention but is interested in bolstering its infield situation. It remains to be seen whether he’ll be given an everyday role at short or will instead share time there with Lourdes Gurriel Jr. while also moving around the field. The 2018 season turned out to be Galvis’s most productive overall effort at the plate, with his .248/.299/.380 slash and 13 long balls translating to a personal-high 85 wRC+. That’s still not much offense, obviously, but it’s a tick above his lifetime output (.246/.290/.374). How to explain the fact that Galvis has been a steady regular for the past four seasons? Beyond the fact that he’s obviously a respected and dedicated professional, with the benefit of being a switch-hitter with both pop and speed, glovework obviously represents the carrying tool here. Galvis is quite sure-handed, having been charged with just 24 total errors over the past three campaigns. Metrics are not unanimous on Galvis’s abilities at short, but generally reflect a positive view of his glovework. Oddly, he started out as a Ultimate Zone Rating darling who wasn’t as well-loved by Defensive Runs Saved, but the two systems flipped on him last year (-3.8 UZR, +7 DRS). While he’s primarily a shortstop now, it probably doesn’t hurt that Galvis has a good bit of experience elsewhere as well. Previously, he has spent time at second base, third base, and left field (along with a one-game stint in center). As for Barnes, the 29-year-old righty had a strong 2017 showing in Toronto, working to a 3.55 ERA with 8.5 K/9 and 3.3 B/9 through 66 innings of relief. His extreme proneness to fly-balls, penchant for surrendering homers and an unsustainable 81.6 percent strand rate made him a clear regression candidate, though, and that proved to be the case. Barnes was clobbered for a 5.71 ERA with 8.4 K/9 against 4.8 BB/9 in 41 innings this past season. The Pirates have been connected to free-agent shortstop Freddy Galvis this winter, though general manager Neal Huntington suggested Saturday that a deal between the two sides won’t come together. “We feel like we got a young Freddy Galvis. His name is Erik Gonzalez,” said Huntington, who added the Pirates are optimistic Gonzalez and fellow middle infielder Kevin Newman will “be as good if not better than what Freddy Galvis or any of the others who are out there right now or any of the players we can get in a trade right now” (via Chris Adamski of the Pittsburgh Tribune-Review). The 27-year-old Gonzalez didn’t provide much at the plate in Cleveland from 2016-18, but Pittsburgh was excited to acquire him in November, and he’s now the favorite to serve as its Opening Day shortstop. Pirates scouts were “beating the table” to get Gonzalez, who they believe will be “’above average. Dynamic. Very good. More range than anybody you’ve had at short maybe some you have managed,'” manager Clint Hurdle said. Pittsburgh is far from the only team eschewing sizable free-agent contracts this offseason, which Pirates right-hander and union representative Jameson Taillon spoke about Saturday. Taillon’s fellow players are “pretty riled up and pretty upset” about the current state of affairs, revealed Taillon, who was present for the union’s recent board meetings, Brink reports. While Taillon conceded that players are hard to sympathize with because many are earning millions of dollars, he pointed out that “the owners are making money too, and they’re making way more than we are.” The players, mindful of that fact, may be more inclined to go to arbitration rather than accept what often end up as team-friendly extensions during their arb-eligible years, Taillon contended. Taillon’s words are the latest indication that the players and owners could be in for an ugly labor war when the collective bargaining agreement expires on Dec. 1, 2021. The Pirates have “big interest” in free-agent shortstop Freddy Galvis, according to George A. King III of the New York Post. In Pittsburgh, the switch-hitting 29-year-old would take over for Jordy Mercer, who signed with the Tigers earlier this week. Joining the Pirates would also mean a return to Pennsylvania for Galvis, a Phillie from 2012-17 who spent last season in San Diego. Across 3,096 major plate appearances, Galvis has batted .248/.299/.380 with 65 home runs, including 13 in 2018. Once the Padres’ signing of Ian Kinsler becomes official, they’re “likely” to designate infielder/outfielder Jose Pirela for assignment, AJ Cassavell of MLB.com reports. Even if the Padres don’t designate Pirela, he’s not long for their roster, Cassavell suggests. The 29-year-old Pirela, a member of the San Diego organization since it acquired him from the Yankees in 2015, racked up 817 PAs at the major league level from 2017-18 and managed a respectable .265/.320/.405 line with 15 home runs and 10 stolen bases. While free-agent second baseman DJ LeMahieu has been on the Nationals’ radar, they’re “more likely” to look for a cheaper infielder, per Jesse Dougherty of the Washington Post, who lists Brian Dozier, Josh Harrison and Jed Lowrie as speculative fits. Although, in MLBTR’s estimation, Lowrie will easily land the richest contract of that quartet this offseason. With shortstop Didi Gregorius set to miss a large chunk of next season, the Yankees are reportedly in the market for the best infielder available, free agent Manny Machado. But in the event the team loses out on Machado, general manager Brian Cashman is casting a wide net in his search for infield help. “I’ve talked to [agent] Danny Lozano about Manny, I’ve talked to the agents for Freddy Galvis. I’ve talked to everybody, from high end to low end,” Cashman said (via Bryan Hoch of MLB.com). “This marketplace is deep on second basemen. I have a shortstop that we’re playing at second in Gleyber Torres, so how does this play out?” As Cashman implied, the Yankees could easily slide Torres to short to cover for Gregorius’ loss. In doing so, they’d perhaps be able to add one of the many veteran second basemen available in free agency, though no one from that group would move the needle nearly as much as Machado. The Mets have picked up standout relievers Edwin Diaz and Jeurys Familia this offseason, but given the struggles of their bullpen in 2018, they could still use more late-game help – particularly from the left side. However, after the Mets agreed to a deal with Familia on Thursday, GM Brodie Van Wagenen “downplayed” the possibility of the club adding a high-profile southpaw, Mike Puma of the New York Post writes. It seems the Mets won’t be the next team for either Zach Britton or Andrew Miller, then, but Anthony DiComo of MLB.com points to Tony Sipp and familiar faces Jerry Blevins and Oliver Perez among potential targets for the club. While the Yankees have now marketed Sonny Gray for quite some time, the club is still sifting through offers. “A bunch” of rivals remain interested, per AGM Michael Fishman, who tells Hoch (Twitter link) that some possible deal scenarios would involve major-league assets coming back in return. New York’s reportedly seeking “high-end” MLB talent for Gray, despite his subpar performance in 2018. There’s no room anymore for Gray in New York, yet the Yankees could still pick up another starter this winter to join an already crowded staff that includes Luis Severino, James Paxton, J.A. Happ, Masahiro Tanaka and CC Sabathia. With that said “it sounds like there’s little optimism” the Yankees will acquire Corey Kluber or Trevor Bauer from the Indians, Marc Carig of The Athletic tweets. Either Kluber or Bauer would bring back a haul in return, and with a farm system that has taken some major hits via trades and prospect graduations in the past year, it doesn’t appear the Yankees will emerge from the offseason with either righty. Speculatively speaking, Yankees third baseman Miguel Andujar would make sense for the Indians after the latter traded Yandy Diaz on Thursday. However, while the Yankees are reportedly “open” to moving Andujar, giving him up would create another hole in their infield at the cost of improving a rotation which already has at least five viable options. The Padres have yet to post a winning record in Preller’s four full years as GM, and haven’t had a winning season of any sort since 2010. After another year of rebuilding and focusing on young talent, however, Preller believes the team can take a step forward competition-wise in 2019. “[We’re] starting to climb out of this point where it’s a development mindset, where we’re at the bottom part of the standings….From our standpoint next year we’re going to look to start to compete. You’ve got to get over .500 to do that,” Preller said. The bulk of next year’s payroll expenditures are due to the salaries of Hosmer and Wil Myers, and Cassavell thinks it possible that the Padres could try to move Myers due to the former first baseman’s position crunch. 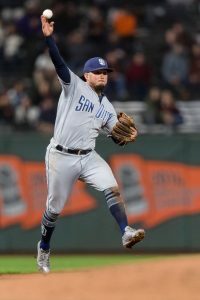 Franmil Reyes and Hunter Renfroe have earned more playing time in the corner outfield spots in 2019, leaving Myers perhaps at third base (where he struggled defensively, albeit in a small sample size) or maybe in a super-utility role at both corner infield and outfield spots. Of course, Cassavell also believes that Reyes or Renfroe could be traded to address the crowed corner outfield situation, and obviously either of those two younger players would be easier to deal given that Myers is owed at least $64MM through the 2022 season. Freddy Galvis could also be a factor at third base, as Preller expressed an interest in re-signing the veteran. Galvis hit .248/.299/.380 over 656 PA while appearing in all 162 games, appearing as a shortstop in all but five of those contests. Galvis hasn’t played the hot corner since 2014, but he’d have to shift into a utility role if he returns to San Diego, as the team plans to give more infield time to its top young players next year. Nick Piecoro of the Arizona Republic breaks down the tough choices facing the Diamondbacks this winter. Taking another crack at contention would mean filling several needs. It’d also come with some clear risks. As Piecoro well explains: “For years, the Diamondbacks have had just enough talent to want to keep pushing forward, but not enough to seriously contend for a World Series. And, it seems, each time they’ve tried to load up, they’ve only set themselves back further from a possible championship.” It’s a really interesting initial look at the complicated situation, including some takes from rival executives from around the game. It could soon also be the end of the line for Carlos Gonzalez with the Rockies, as Patrick Saunders of the Denver Post recently explored. Understandably, the veteran outfielder is focused on finishing out what could be a special season for the Colorado organization. He has been getting less opportunities of late, which seems likely to be the prelude to a departure via free agency this winter. Whether or not that’ll come to pass, CarGo (much like Pence) says he’ll continue to “try to take advantage every night” of the chance to suit up. Soon to turn 33, Gonzalez carries a .276/.329/.463 slash line through 489 plate appearances — good for an approximately league-average overall output once adjusted for park effects and league context. Finally, we’ll turn to yet another pending free agent. While the Padres’ youth movement is the primary hope for the franchise, the team still needs to fill roles. That could conceivably lead to a reunion with shortstop Freddy Galvis. As AJ Cassavell of MLB.com writes, Galvis has been on a tear at the plate to end the season. And it seems he has generally left a good impression. While fans are pining for Fernando Tatis Jr., skipper Andy Green notes that there are reasons to like the idea of a return for Galvis. Tatis, after all, still has some seasoning left. That leave room at short to open the year, at least, in addition to the possibility that Galvis “could bounce around,” as Green put it. Of course, the veteran infielder is also likely to test the waters to see whether he can pull down more money or a better opportunity elsewhere. He’ll be among several glove-first veterans hitting the open market.